A Boeing 601 HP commercial communications satellite, Measat-3 was launched from Baikonur, Kazakhstan into geostationary orbit at 91.5° E. Also launched from Baikonur to orbit at 91.5° E, Measat 3a was constructed under Orbital Sciences Corporation’s Star-2 platform and entered service in 2009. Both financings featured a successful collaboration between U.S.Ex-Im Bank and private lenders, involving structured finance terms suited to Measat’s evolving business. 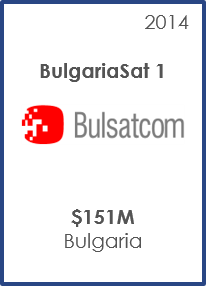 Terms involved tailored, amortization, debt reserves, and financial covenants requiring increasingly strong financial performance by Measat, which now has a fleet of six satellites that serve 80% of the world’s population. 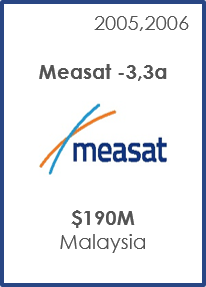 Measat-3a flexible covenant package was important to minimizing financial consequences of the satellite’s being struck by a crane in 2008, which delayed launch by one year. Space Systems Loral constructed Hispasat 1E, which began operating at 30° W, in 2010 and Amazonas 3, which entered service in 2013 and is operating at 61° W. Also operating at 61° W, Amazonas 4A was constructed by Orbital Sceinces Corporation and entered service in 2014. All three satellites were launched by Ariannespace and were financed by Euro-based commercial loans that were jointly guaranteed by Ex-Im Bank and Coface. Transactions based on corporate finance without asset security, with insurance provisions to offset lack of security. 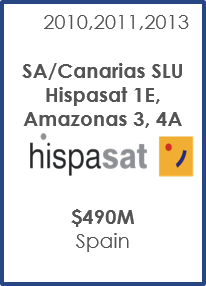 Hispasat 1E was the first satellite guaranteed by Ex-Im Bank following the financial crisis. Amazonas 4A was awarded Ex-Im Bank Deal of the Year.